GIA is where students from all over the world build successful careers in the gem and jewelry field. The Graduate Gemologist (G.G.) 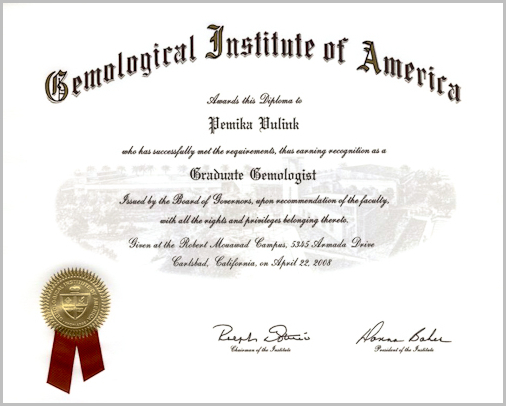 diploma, which focuses on gem grading and identification, is the industry’s highest professional credential. You can verify Pemika's G.G. and A.J.P. credentials in the GIA on-line alumni directory, where she is one of 16 Graduate Gemologists listed in Singapore per July 1st, 2012. For those interested in gemology, brief descriptions of the diploma programs are included below. Graduate Gemologists are able to identify hundreds of common and unusual gemstones and detect the latest treatments and synthetics. They use time-honored identifying and grading techniques using a microscope, polariscope, spectroscope, and other professional gemological equipment. The GIA Graduate Diamonds diploma program teaches to use the GIA International Diamond Grading System™ and the 4Cs directly from their creators. 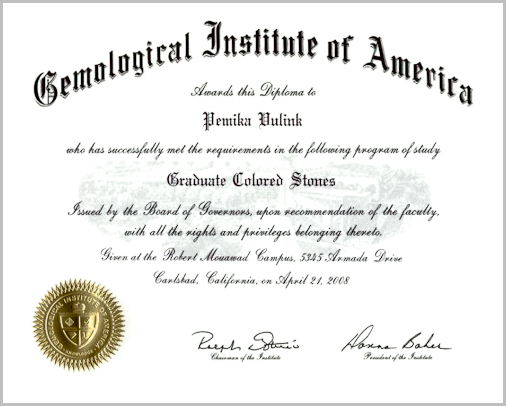 The GIA Graduate Colored Stones diploma program covers the origins of colored stones, how to identify them, and how to distinguish a synthetic stone from a natural. It also teaches how to detect treatments and apply GIA’s Colored Stone Grading System.